Some people define golf as using the wrong tool for the job. With this activity we'll try and find the right tool for the job. 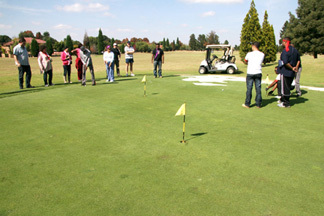 Use frisbees, slingshots and even darts to try and get the ball in the hole. The most important rules are to make as much noise as possible and to enjoy the thrills of golf without the technical difficulties.